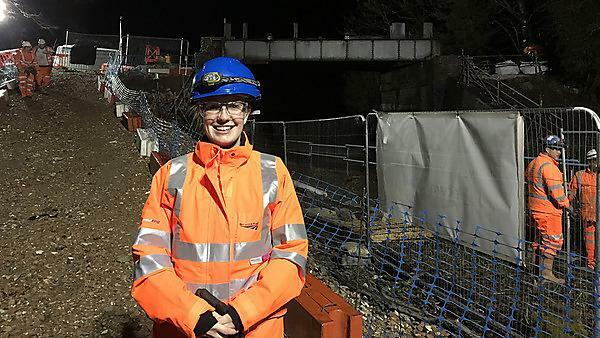 Graduate Project Manager at Network Rail, Vicky Morley, tells us about the tasks she was required to carry out during the project management scheme. Since graduating in September, 2015, I have joined Network Rail on their one year project management scheme. The scheme has two six month long rotations which aim to give you experience in both planning and delivering a project. My previous rotation in Swindon enabled me to see the construction of a variety of developments from railway embankments, to bridges, to electrification projects. In March, I rotated to the London Bridge and Waterloo offices to work on the development Crossrail 2, a new railway being built in London. I am now responsible for collating the information from various functions to facilitate the largest public consultation the company will have ever done. Throughout the scheme there is a personal development programme which aims to develop your soft skills and support you in achieving your Project Management qualification. Prior to graduation I wanted to work in residential construction. I currently really enjoy my role but, perhaps in the future, for the right position I would move into the industry. Being given my own bridge repair project at week three of my first rotation was very challenging. To be given such responsibility so soon was daunting, but the challenge of managing the contractor has been very interesting and I have learnt a huge amount. Witnessing a bridge capable of carrying four lines of train track over a newly built dual carriageway being developed and later 'slid' into place. It's not the kind of project that happens often, so the sense of excitement and anticipation from the project team was unique. I would have taken the time to try and get a better understanding of the industry prior to starting, so I could make better use of my time on the graduate scheme. Network Rail gives you huge flexibility to explore the business which you can only exploit if you understand what it does. Be bold and willing to learn. Being keen can take you far. You do not necessarily need an engineering degree to work in a line of work that appears to involve lots of engineering. It gave me the confidence to explore other lines of work. I would never have considered the railway before. After exams, going down to the Hoe with my course mates for a BBQ and to play rugby: it is such a beautiful place to chill out and it’s right on your doorstop. Yes. I recently attended our course annual dinner (attended by current students, alumni, and lecturers) and frequently see my close friends. I also work with the daughter of one of my lecturers – crazy! Yes. Plymouth has a lot to offer its students. It has a unique combination of natural and city life, so it is able to offer both the amenities of a city (good nightlife, shopping centre, cinema, theatre, live venues, winter markets) but it is still only a short drive or ferry from some of the best beaches and walking routes in the country. It also has good relationships with global universities enabling students the opportunity to travel and study. It’s perfect!